Jumbo activity with 30 words for students to find. Each word is a key word from the story of Selma. Students will enjoy the activity. It encourages them to learn how to spell important vocabulary. 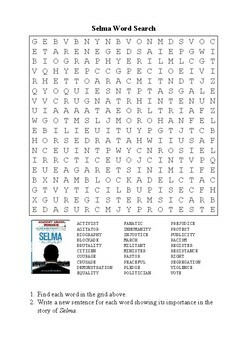 In addition to finding words in the grid, students are asked to write one sentence about each word, explaining its importance in the context of Selma. This helps reinforce their knowledge of the events they see in the film.